Juergen Haberman: The German neo-communist informs a considerable part of German thinking on Europe, though one suspects from his writing that he is not too pleased with German strategy on the Crisis. I’ve been reading Juergen Habermas slim volume The Crisis of the European Union: A Response, and I have to say that it is an exceptional read. Not only is it very accessible – important, if you’re trying to send a message to politicians – but it is equally concise. These are big thoughts, and grand ideas, and it is easy to get bogged down. Highly recommended to everyone reading this – if you’re interested in my blog, Habermas is a must. These are some of the notes I took on the Preface. Right on the first page of the preface, Habermas puts the current crisis in the EU down two two key factors – differences in economic culture (which is probably polite) and secondly unpredictable environments. The two are related. In a sense, the second argument is both moot and a part of the first factor. It is moot in that environments are unpredictable, and all unions, agreements and relationships are subject to environment. That they persist in spite of the vagaries of environment is certainly a testament to the strength of any agreement, and there is no doubt that the environment – in particular the Global Economic Crisis that was precipitated in large part by the US sub-prime debacle – was testing. But in terms of unpredictability – predictability comes from the maturing of institutions within which the agreement or union is to be exercised. And that maturity is born of culture – both political and economic. The cultural differences he mentions are primarily contrasting the mature manufacturing and finance based economies of central Europe, particularly Germany, with those of primarily peripheral economies based on more cyclical or speculative industries, including tourism, property, and commodities. There is also a problem of relativity, in the tight alignment of nations within the EU, and the even tighter alignment of economies in the Eurozone. Not only are there structural incentives to track growth across the Eurozone notwithstanding disparate underlying real growth (or lack thereof), but there are cultural pressures too. Interest and exchange rate harmonisation meant that underlying softness in periphery countries could not be naturally counterbalanced by increased interest rates to discourage borrowing, or in extreme cases currency rebalancing. Similarly, in those countries that performed well, there was no attendant inflationary pressure due to the single market to offset spending. In such an environment, countries with less strong economies had the wrong incentives structures in place, borrowed more, and became over-exposed. Countries with stronger economies – and the financial services infrastructure to leverage the growth into persistent infrastructural / standard of living increases – were also poorly incentivised, and loaned too much to those countries that – in the long run – were unlikely to sustain the debt. The overarching infrastructure of the Eurozone secured the status quo until a shock – the US sub-prime mortgage scandal – pushed everything over the edge. The key, however, is the difference, the relativism. It is not that the economic culture of Germany was better than the economic culture of Greece, though there were (and are!) practices in Greece that could certainly be described as objectively economically wrong-headed, but that the integration of the two would inevitably cause crisis. It was, in essence, a systemic issue – the Greeks were incented to borrow more, just as the Germans were incented to loan more to the Greeks. 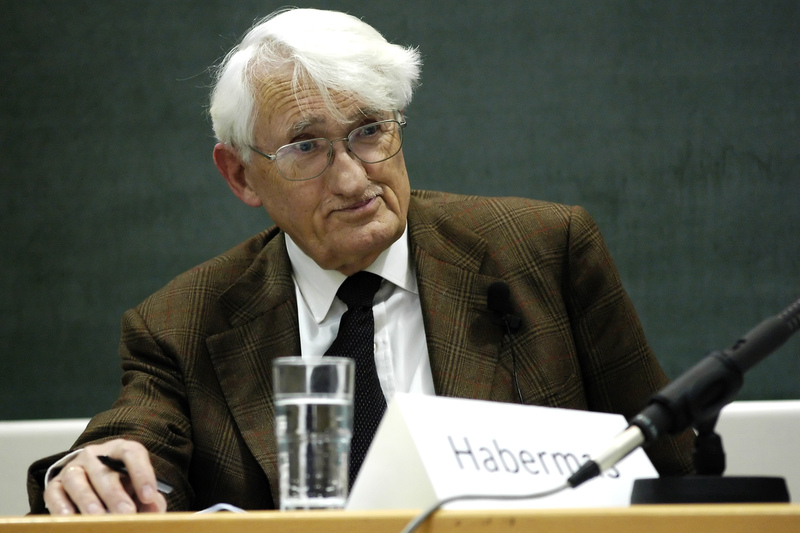 Habermas goes on to describe current plans – which are being executed as we speak, as the book was written in late 2011 and published in 2012 – to restructure the administration of the Eurozone economy and the European Union. In particular, he talks about the ‘kind of executive federalism of a self-authorizing European Council of the seventeen [that] would provide the template for a post-democratic exercise of authority.’ It is an undeniable ‘intergovernmental undermining of democracy’, he continues. Further, he says, politicians have become little more than a functional elite, shorn of vision and without genuine leadership. This is a serious crisis at a global level – I remember hearing Mikhail Gorbachev addressing the Russian-Irish business community in receiving the freedom of the City of Dublin in 2002 lamenting the dearth of Global Leadership. Habermas sees this as a great opportunity to pursue the cosmopolitan ideal, a kind of neo-communism that can begin to erode the ills of the market economy and return to genuine socialism rather than any cynical, neoliberal abdication of responsibility of the fate of the planet to some unseen market force. For that, in essence, is what has happened. Neoliberalism swept away any sense of the necessity for big government, any requirement for leaders and politicians to actually lead. Politicians became exclusively populist, shorn of idealism, and – as Habermas describes them – functionary. Their job was to accelerate privatisation, maximise the exposure of government function to market forces, which with appropriate (and light touch) regulation would most efficiently serve the needs of people. Habermas argues that the erosion of sovereignty started a long time ago, and that those who decry current plans long since lost the argument that it’s a bad thing to cede control to supra- and inter-national organisations. This ‘executive federalism’ further pulls sovereignty away from democratically elected government, but there is a push factor as well, in the empowerment of Sir Humphrey’s in the civil service, and the permanent government. We have arrived at a place where the job of the politician is purely to serve as a lightning rod, to take the credit when things go well, to take the blame when they don’t, and to serve the gladiatorial thirst for drama from the subjects of the nouveau régime. A final point – Habermas uses the word legitimation as that which politicians seek, in order to protect their interests and their positions. In essence, he accuses politicians of being populist and not strategic, which ultimately sacrifices the futures of their peoples for short term gains. Legitimacy, it appears, is equal to popularity – at least according to Habermas. We have seen that language in Ireland too, where a democratically elected government became massively unpopular, and was chastised for being illegitimate, and without a mandate. In the context of my overall project with this blog, it’s an interesting nuance.